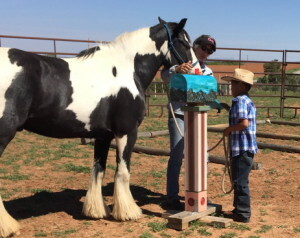 The Buffalo Woman Ranch herd has been involved in Equine Facilitated Learning, known as EFL, since 2003. Our herd of 8 horses is diverse, each with their own gifts to offer in the equine/human experience. All horses are, by their nature, able to sense energy and reflect what they experience back to us. Our herd has been involved in this work for close to a decade. Over the years, we have nurtured and sustained a unified field of energy with the herd, the people living on the ranch and the land. This has established a foundation for all who come as a container of safety and love. So often we hear stories of how a horse has comforted their human partner in times of grief or sadness. Too often in the horse world, horses are labeled as “bad” or having “behavior problems” when in actuality they are only responding to what their human partner is carrying within them on an emotional or energetic level. When a person is incongruent (i.e. stating they are “fine” when in reality they are angry, or sad or scared) with how they are feeling, not being honest with themselves or sometimes unaware, horses may become agitated, resistant or fearful. What horses give and request is honesty. Then they can more easily focus on what is being asked of them. It has been found that horses (and other sentient beings) experience the human energy field as a “ripple” or wave.This wave has been documented on scientific equipment designed for imaging human energy fields. 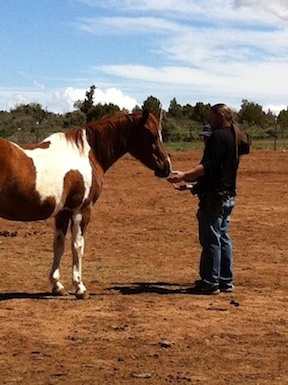 I personally have witnessed many interactions between horses and humans where our equine partners have demonstrated a profound healing capacity as they interact with this energy field. We will be adding photos and bios of the herd as the site is developed, as well as the opportunity to sponsor a Buffalo Woman Ranch herd member, so stay tuned! Name: Aingeal (Angel) in Gaelic. Aingeal is called a “Gypsy Blue” horse as she has blue in her eyes. She is white and her presence is often experienced as that of a unicorn. We met her in Ireland in 2006; she been an integral part of our EFL work and kids programs since 2008. Aingeal is gentle and kind with children and a powerful teacher with adults. She is “quintessential love” manifested and a highly spiritual being. Beau has been on the ranch since July of 2005. A local couple that had purchased him as a riding horse donated him to us. After a 2 hr. trail ride they discovered ‘Norman’ (his name at that time) was lame with ring-bone. After meeting us and learning about our equine experiential programs, they asked if they could give him to the ranch. He was renamed “Beau” when he arrived here, which he likes very much. Beau has been quite the ‘wounded healer’. He has a beautiful heart and often works from a distance, sending energy to those participating and holding space as other herd members do their work with our clients. We call him the wise Shaman of the herd as he works on very subtle yet powerful levels. Sponsorship of Beau would help us continue to provide him with the supplements and farrier care he needs to maintain good mobility and to live with minimal pain from his arthritis. Bella has been on the ranch since she was rescued at 18 months of age. Bella is a sweetheart of a horse and loves to work, be it in equine experiential sessions or carrying a rider. Bella underwent surgery in the spring of 2013 for the removal of her ovaries; she has recovered well although we have not begun riding her again for any distance. She continues to need herbal support for maintenance of healthy hormonal levels and has responded very well to cranial-sacral sessions for release of physical and emotional stress. Bella gas given to our clients in extraordinary and generous ways, she is almost always a participant in sessions and often works directly on the body/energy systems in a deep yet very safe manner. Brigid foaled out amongst a large herd on pasture in Ireland in 2006. She came to the BWR in 2007, spending her first several months in Florida with her dam Aingeal. Brigid had no difficulty integrating with our herd of 8 horses (at that time). She had well developed social skills and a strong sense of self. Brigid was trained “under saddle” on the ranch; she did not respond well to ground driving once the bit was incorporated, making it clear she did not want to be a driving horse! Brigid has enjoyed being ridden western with classic reining horse moves second nature to her. She has excelled as a therapy horse during EFL sessions, being a powerful feminine presence highly sensitive and intelligent as an ‘earth energies’ anchor. She is now almost all white like Aingeal, with some charcoal grey splash on her hind legs from her sire, a ‘Black Blangden Splash’ marked stallion in Ireland. Sponsorship of Brigid would apply to her feed costs and further training. Cody was the 4th horse to come to our ranch. 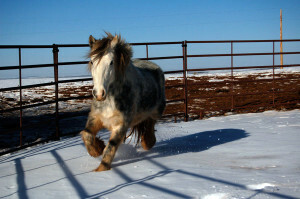 He was rescued from a ranch in Colorado. Cody, being 16.5 hands tall is quite a presence, a generous horse with a sweet nature, and a sense of humor. He has been a profound participant in many EFL sessions. He has a history of back pain that has affected his ability to become a riding horse as well as a clubfoot. He has received acupuncture, Bowen, chiropractic treatments and lots of love. Sponsorship of Cody will be applied to his feed and farrier costs as well as a series of cranial-sacral treatments in the hopes that he could be pain free, and possibly even ridden. Hermanito is a Mustang from Texas. He was donated to BWR in 2009. His previous home was on a ranch in Texas; he lived with Apache. They were given to the ranch together as bonded pasture mates. Hermanito, which means ‘little brother’ in Spanish, is a high sensitive. His mustang nature is evident in his hyper-vigilance and keen sensitivity to emotions and/or physical energy patterns. He is very generous in his way of contributing during a person’s equine experience. He is also an outstanding partner in consensual leadership activities. He needs a further training as he is still quite ‘green’ when it comes to hours under saddle. Hermanito would benefit from donations towards the purchase of a saddle and bridle for him, as well as hay costs. He has been under saddle minimally as he injured his right shoulder several years ago@ BWR while protecting our beloved goat Cleo. He has healed well and is ready for more adventures on and off the ranch. Liberty was sired by DunBrody of Roscreigh a North American First Premium model stallion; a multiple national champion sire. His dam is Earth Energies Queenie from Wisconsin. He is of old Irish bloodlines. Liberty is well named as he exudes a powerful expression of freedom of spirit. He is a natural, kind leader, very charming and athletic. He offers his heart and wisdom willingly to those he encounters. The Buffalo Woman Ranch has experienced the loss of 4 magnificent horses over the past 6 years. Kawaayo was the first in 2006. His illness was never diagnosed, all of his titers came back negative on tests done. His loss, as well as the others, have been a journey in the river of grief. They each have given tremendous heart and soul to the ranch and all who have met them, as well as teachings which continue to live on to this day. I will do my best to honor each being individually in these pages on ‘Spirit Horses’. Their energy and profound wisdom have permeated many equine experiences that have transpired before and after their departure from this realm. There are stories to share, rich threads in the tapestry of healing experiences on this ranch. The weaving is ongoing. If anyone has a story they would like to share please submit a copy to me and I will include as able. 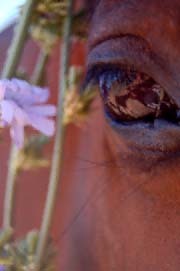 Kawaayo was an amazing horse whose gift to those he touched was empowerment. His teaching for me personally was about stepping into my masculine power, with a willingness to speak and stand in my truth. That’s no easy task for a personality that would take care of others needs at the expense of one’s own. I remember when I first attempted sending him around the round pen for some traditional active round pen work. He would just stand there and look at me with his wise eyes and an expression of “who do you think you are?” and “don’ t ask me to do this if you don’t really mean it.” He had the distinctive qualities of a general with little tolerance for any horse or human insecurities. 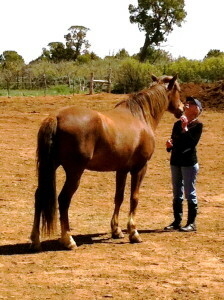 He was the first horse to reflect my issue of indecisiveness, being hesitant to ask for what I really wanted or needed. When I learned how to ask him in a clear and congruent manner, he moved around the pen with no problem. He wanted a leader who was confident. There were occasions in the reflective work with clients when Kawaayo would just stand there, waiting for honesty. He was strong, handsome and powerful. He learned to open his heart as he developed compassion for humanity and our struggle to be free of the ego.